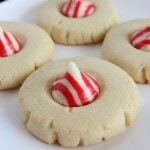 Check out this easy recipe for classic peppermint cookies. In a large mixing bowl cream together the Butter and Sugar until light and fluffy. Add in the Egg, Vanilla and Peppermint extracts, mix until smooth. In a separate bowl combine the Flour, Salt and Baking Powder. Add the flour to the mixing bowl in thirds mixing will between each addition. Take 1 tablespoon at a time and roll into balls, place on a lightly greased cookie sheet. Flatten the cookies until about ¼ inch thick. Take a wrapped kiss and form a shallow depression in the center of each cookie, about halfway through the cookie. Bake at 350˚ until the edges are just barely starting to brown, 8-10 minutes. Immediately place an unwrapped Peppermint Kiss into each depression. Wait about 5 seconds then very gently push down on the kisses to make sure they get set, not too hard or they will squish everywhere. Let the cookies cool and kisses set up in a cool area, about 20-30 minutes. Serve or keep in an airtight container.